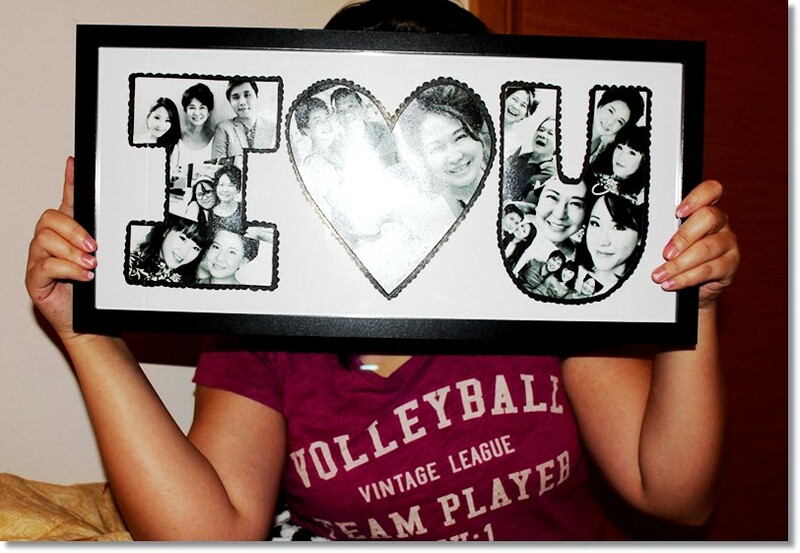 Collage Art: A personalized handmade gift for my mum on Christmas! I trust that you’ve had a fantastic Christmas, yes? I certainly hope so There’s always New Year’s Eve to go ball crazy if you didn’t have that good a time on X’mas. Mine was simple, and quiet, dinners with family, gifts exchanging and board games at Marina Bay Sands. Then getting drunk at night with friends. Yeeeppp. Still a little bit hungover on Boxing Day as I’m typing this. 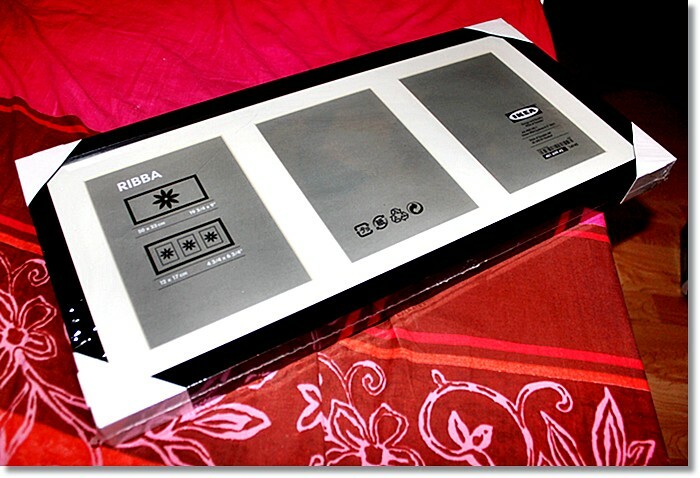 So a big part of Christmas for me is the presents.. Not necessarily receiving them, but more about giving them! I always make sure I try to get the person the best possible present that is either thoughtful or practical within a reasonable budget. If I REALLY really like the person, I will hand make them a gift if I have the time… and I absolutely love my momma, so I thought I’d do something nicer for her this Christmas. Hand written cards are too boring and I want her to have something totally unique, so in the end I came up with this!!! 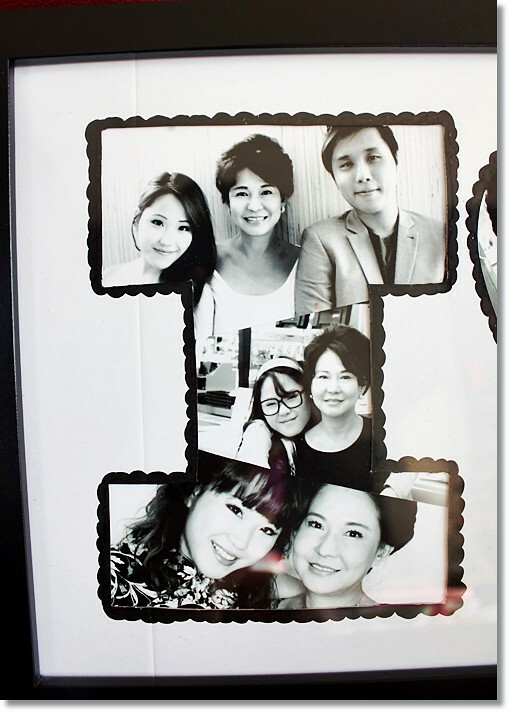 If it’s not obvious enough, it is a photo frame filled with collages of heartwarming smiley pictures of my mother and the people she holds dear to her heart, in the shape of a giant “I ♥ U”!!! I want her to wake up every morning and be reminded that someone out there in this big big world, loves her very much. 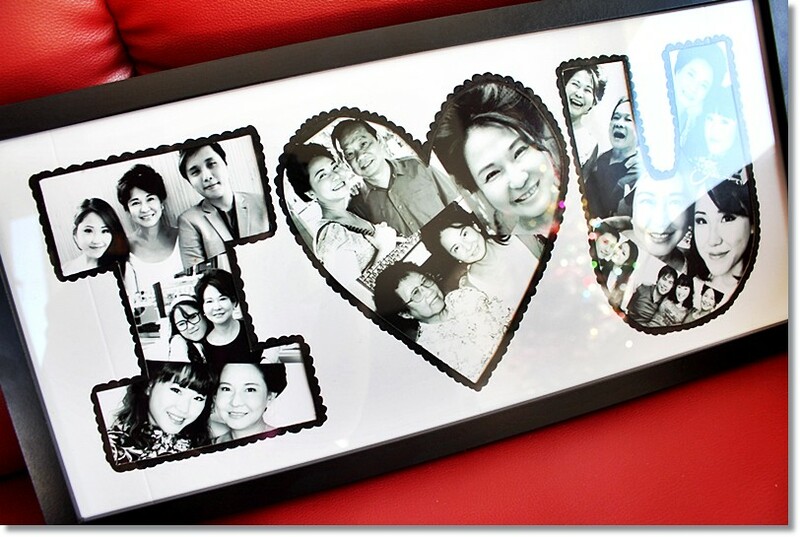 Every bit of this was handmade (except the frame which I bought from a store) and I think it screams sincerity and originality, so I want to share with you guys a short tutorial on how to create this for your own loved ones too! 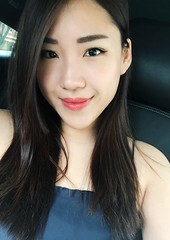 I know X’mas is over now, intended to blog about it before then but I didn’t want my mum finding out beforehand and ruining her surprise. But you can still do this for your partner on your anniversary, Valentine’s Day (which is coming up soon).. or heck, just do it anytime you can for anyone you like in general for no special occasion, except that you totally ♥ them!!! It will take some time and effort, but the look on their face when they receive this is so going to be worth it. So let’s get started! 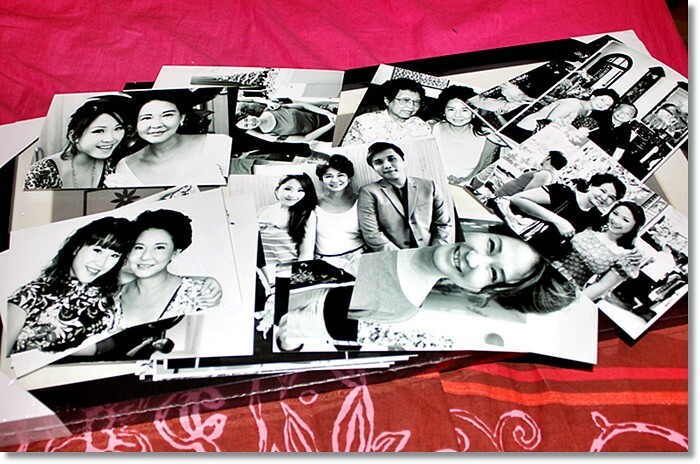 Compile 15-20 shots of happy memories of your loved one captured on camera, edit them to be black and white, then print them out. Have a mix of close up shots and mid-shots. Full length shots will be redundant. Editing them to be black and white is important because it creates a timeless effect, and the photos will look less cluttered and generally a lot prettier when you put them all together. Skip this step and your result will differ a lot. If you don’t have a good image editing program to use, try Photoscape. I think it is one of the best free-to-use image editing software out there – simple interface and amazing quick results! ^.^ Highly recommend this. The size of your printed photo would depend on the frame size you choose, but if yours is around 25″ long like mine, then 4R is a good size. You be the judge of the photo size. If most of your photos are close ups, then get a smaller size, and vice versa. 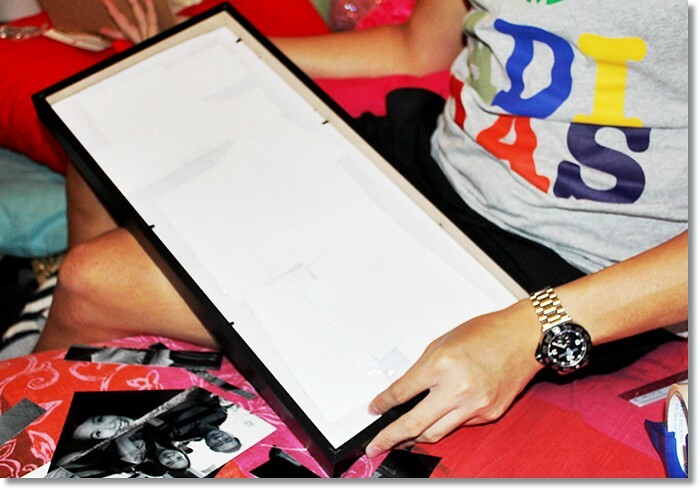 To create your collage shape, you will need a piece of thick white paper / cardboard that is the exact size of your photo frame. When you finally have your collage base custom fit to the size of your frame, use a pencil and sketch out the shape of the collage you want. 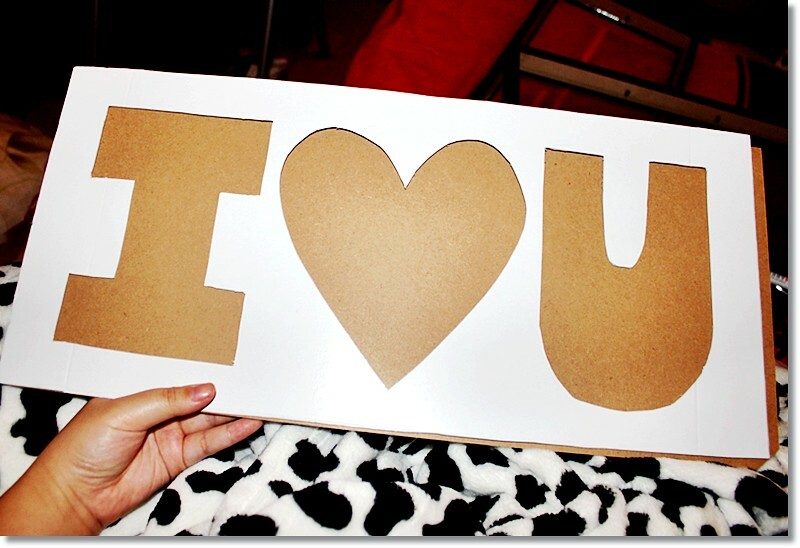 I suggest using I ♥ U for the shape because it gets the message across and it’s short enough. A long message more than 4 letters is not suggested. If your loved one has a short name like mine, then something like S A M would also work! After you’re done with that, cut your desired shape out with a pen knife. You want bold, thick, fat letters. Be careful when you’re doing this because if you screw up the shape, it’s going to be quite obvious. 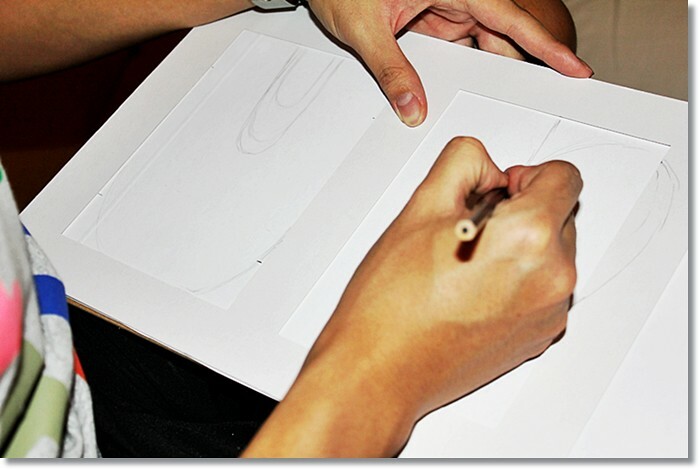 It doesn’t matter if the back is ugly due to your rough sketching – you can’t tell that from the front, so sketch away. 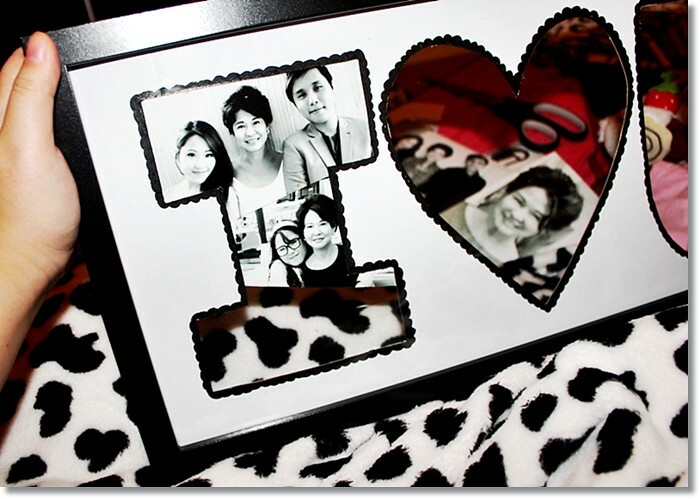 Test out how your stencil / collage base looks in the frame! So far so good. This part is optional, and you can get creative. 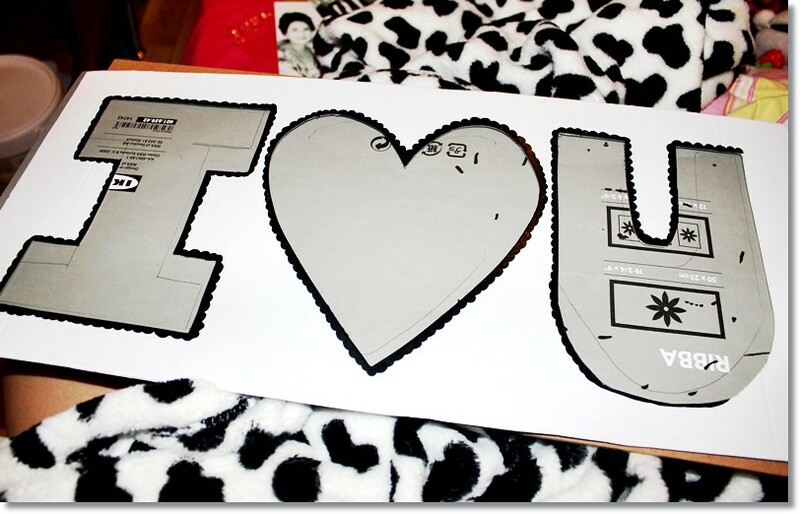 I traced the outline of my “I ♥ U” and did a lacey type of pattern with a black permanent marker. It’s not fully completed on the letter “U”, if you wanna compare a before and after. You can add any design you want on the white part, but I wanted to keep most of it clean and white, so this was a good design. It also gives the whole collage some needed depth. I invited my friend Nicholas over to do some arts & crafts with me! Here he is, enthusiastically coloring his whole base black with a marker. LOL. He did this because he didn’t cut his “I ♥ U” shape out very well and you could see the parts where he messed up. Coloring it black does make the flaws less obvious but I don’t really recommend it. Get a pair of scissors and some tape ready. This is the fun part. 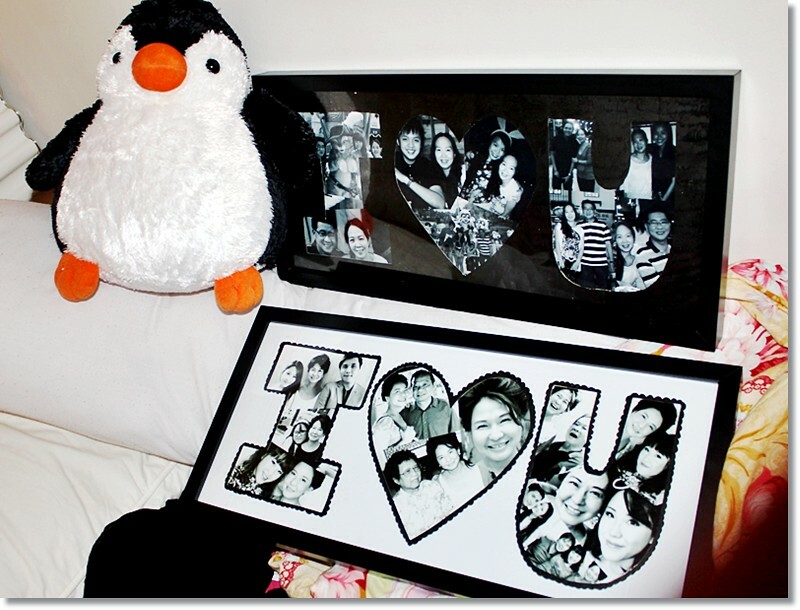 Now it’s time to arrange your photos into a pretty looking collage! 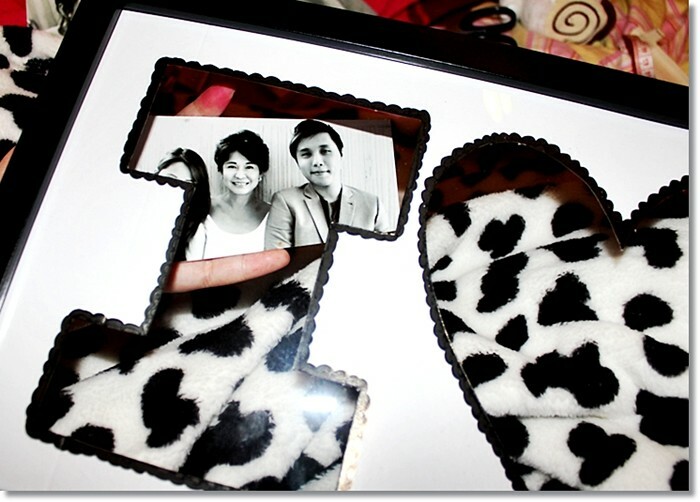 You will have to cut the pieces into smaller shapes that fit inside the letter, so hold your picture behind photo frame like I am doing in doing in the picture above to view how it’d look like from the front, then when you’ve found a nice arrangement, cut the photo into an appropriate size & shape then tape it down securely on the back. Work your way from there, doing 1 picture at a time. This is what it will look like from the back. Squint hard and you’ll see a lot of tape at the back. Once again, it doesn’t matter how it looks like on the back, only the front! If you find my explanation confusing, just look at my pictures and use your brain. Lolol. Give your photos a slanted edge so that it looks extra artsy and random! 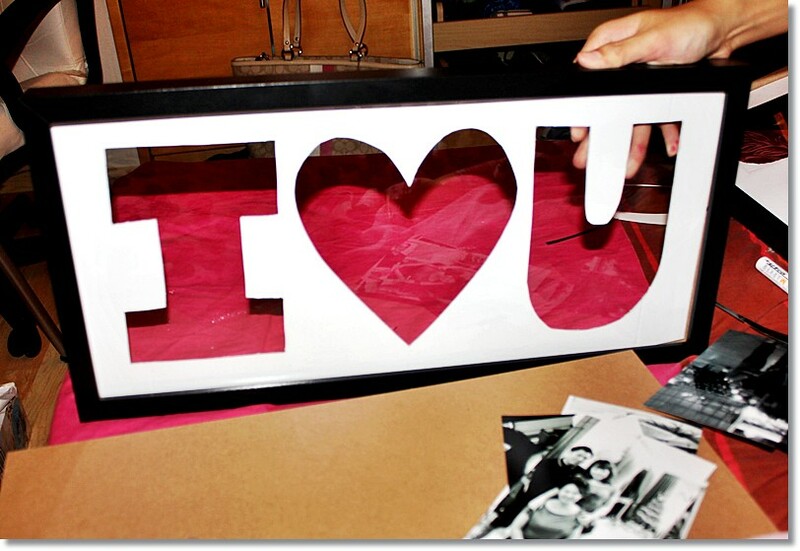 Use bigger pictures for fatter characters like the “♥” shape, then save your smaller pictures for thin letters such as “I”. When you’re FINALLYYY done with all this tedious work, you’ll end up with something as pretty as…. It’s not that difficult, anyone can do this with enough patience! It is actually more labor intensive than it looks, took me and Nicholas about 3 hours to finish everything. It would sit all pretty-like in a room and add instant warmth!!! I am so pleased with myself ahahah. Turned out better than I thought it would. I hope you’ve found this tutorial meaningful and useful! And that whoever you make this for would absolutely love it Feel free to leave me a question or a comment if any of my steps above weren’t clear enough.